Our mission is to improve and/or maintain the health of older adults living in the community through physical activity and education. Groups are led by peer volunteer leaders or staff who have taken the Forever…in motion leader training. and are primarily older adults (50+). All volunteers are registered with the Saskatoon Health Region. 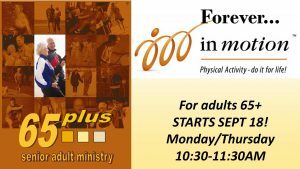 This training includes: information on how to lead safe exercise programs for older adults, chronic conditions and preventing falls as well as lots of practical hands-on experience. Register Online and then download and complete the 2019 PAR Q form and bring it with you to your first class. You can download a registration form to give to a friend as well.